Likely the best way to see Milan! The tour allows you to see many locations to give you a more complete appreciation of the city. One note of caution: adults in Milan rarely wear helmets, so either bring your own helmet or prepare to wear a vintage style. 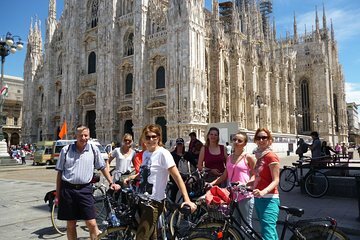 The bike tour allowed us to venture a little outside of the touristy parts of Milan. It was a great day and awesome time. Very fun for our family. Fun way to see the city. This was not worth the money. The guide was like a talking book and gave us no time for taking pictures. It was all details and lecture. Couldn't wait to be done with it so we could explore on our own. We got lost on the way to the meeting point, tried calling the number 10 minutes prior to the start time of the tour but there was no answer. We arrived 15 minutes late and as we expected there was no one at the meeting point. Called the contact number again and this time the call was answered, I asked if we could catch up to the tour group but was advised no and that they had tried to call my mobile - I had no missed calls. They agreed to let us transfer to another day and would send available times to my mobile number ... no message was received as advised. We understand that it was our fault for being late however disappointed we missed the tour and even more disappointed with the customer service provided. We always use Viator for our tours but if this is how your local providers treat regular customers we will have to think twice before making further bookings. The guide was terrible. She had no communication skills. Ignored everyone else. 2 guests fell from the bike and the guide was not even aware. Been these tours all around the world but this one with Italian guide (with a terrible English accent) was the worst. Milan is a beautiful city though. Great tour - gave me a good overview of the city and the guide was very knowledgeable. Good cyclepaths and barely any hills so wasn't too strenuous! Prepare yourself for the aftermath of sitting on a bike for 3 hours though!